With the festive season well and truly here, what better way to get in the mood than journeying to the Far North via the power of children’s fiction. And in similar territory to where Holly Webb went last year with The Snow Bear, she re-treads with The Reindeer Girl, another warm tale to cosy up with on those long winter evenings. My girls should be way too old for this now. And yet I know they’ll love it anyway, the simple but evocative illustrations (courtesy of Simon Mendez and the Artful Doodlers) complementing Holly’s craft as an accomplished storyteller for the under-10s. There are clear similarities with The Snow Bear – another favourite in this house – not least as again we follow a little girl with a family link to the Arctic circle, as fireside stories become dream-like realities. But in The Reindeer Girl we swap adapted Inuit tales from the Far North of Canada for Sami stories from the Far North of Norway. Yet why change a winning formula anyway? This time we focus on Lotta, who loves to hear her great-grandmother’s stories of her childhood, herding reindeer in the snowy north, dreaming of such adventures. And one night just before Christmas she wakes to find herself in Oldeforeldre’s world, with a deer and calf of her own to care for. We follow Lotta and her parents from Tromso airport, off to meet Mum’s Norwegian family, the little girl excited to finally meet her great-grandma as the wider clan come together to celebrate her 90th birthday. Lotta has always warmed to those tales of the crisp, freezing cold air in the Finnmark Highlands, of Oldeforeldre growing up in the forest with her Sami family, setting out in springtime to live under canvas or reindeer pelts, ski-ing from camp to camp, their possessions carried by sledge. She’s also desperate to see reindeer in their own environment, and on the way from the airport drops by a family farm to learn something of the modern way of herding in this part of the world, complete with snowmobiles. 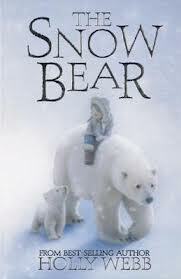 As with The Snow Bear, Holly has a primary teacher’s knack of educating without her young charges realising they’re enjoying anything more than an adventure, captivated as Lotta marvels at the hand-crafted embroidery, traditional costumes, Four Winds caps, reindeer horn carvings and decorated pepperkaken biscuits. When she meets Oldeforeldre, the old lady is struck by a likeness with a cousin of the same name, recollecting how they spent their final days with the Sami before being sent away to school, at a time when the Norwegian government were set on assimilation. We see glimpses of a traditional Norwegian Christmas too, complete with proper candles on the tree, although Lotta soon escapes the bustle of the party to join her great-grandma, and hear more stories of her formative days in her room. She’s soon transfixed by Oldeforeldre’s memories of that bygone era; of winter days helping the reindeer dig for lichen beneath the snow, and spring days when the men took the deer to the calving grounds, the rest of the family later following with the herd – down to the coast and summer pastures before the snow melted and the rivers flooded. As well as a story of a community brought together by their collective labours, the old lady talks about the threats posed by eagles and wolves. While Lotta remains entranced, she’s finally unable to stay awake, nodding off on the seat of the armchair. That’s where her adventure truly begins, the little girl somehow led back to that era and a very different life, woken up by a cousin, Erika, to say goodbye to her pappa as the menfolk head off to the calving grounds. In time, she recognises her role in all this, a special responsibility to look after a deer and its young calf in pappa’s absence. What follows is told with plenty of colour, ideal for confident young readers under their own steam or for parents and grandparents to share with their little ones at bedtime. There’s a glossary too, going into more detail about some of the words, phrases, terms and customs, along with a narrative on the life of the reindeer, and how the Sami helped guide them through the seasons. 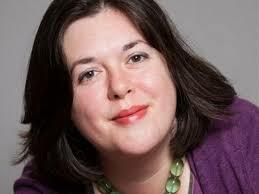 And on the back of her success with The Snow Girl, Holly has again helped bring geography and history to life for a new generation, perfectly fusing storytelling craft with adventure and education. 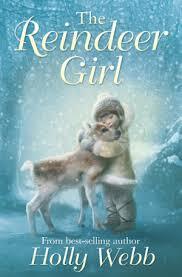 * The Reindeer Girl by Holly Webb (Stripes Publishing, 2013) is available from all good bookshops, and no doubt a lot of internet providers too. This entry was posted in Books Films, TV & Radio and tagged Artful Doodlers, children's fiction, Christmas, Holly Webb, Norway, Sami, Simon Mendez, Stripes Publishing, The Reindeer Girl, The Snow Bear. Bookmark the permalink.